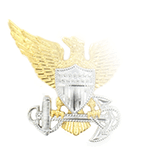 Due in large part to the nature of the Global War on Terror, the United States Navy made the decision in December, 2007 to redesignate Special Operations Officers as Explosive Ordnance Disposal (EOD) Officers. In NAVADMIN 364/07, Chief of Naval Operations Gary Roughead announced that the change was being made because Special Operations had transformed over time to become “EOD-centric,” and the new designation more closely reflected the areas of responsibility of EOD officers. 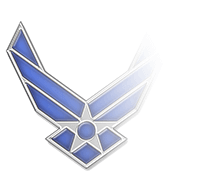 Along with the new designation, EOD Officers were given a new breast insignia. 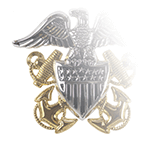 The longstanding Special Operations officer breast insignia borrowed elements from both the Surface Warfare and EOD insignias, with the ship and bow wave from the Surface Warfare insignia flanked by the depiction of an ordnance disposal bomb superimposed over crossed lightning bolts on one side and a Mk V diving helmet over two crossed tridents on the other. 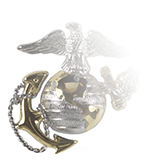 As a reflection of the officer community’s focus on ordnance disposal, this insignia was replaced by a gold version of the Master-level EOD Warfare insignia. 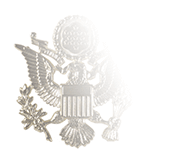 Cast in a gold finish, this insignia features a nose-down rendering of a traditional gravity bomb on a shield with four lightning flashes extending outward on a laurel wreath. A star is superimposed on the bomb on the shield, and surmounting the shield another star in a circular laureal wreath.